Veselka Ivanova graduated in 1993 from the The Academy of Music, Dance and Fine Arts – Plovdiv, Bulgaria. She received a Diploma of Completed Higher Education in Violin, Music theory, Music history, Teaching and Choir leading/conducting. From 1992 -2000 she worked alongside her husband in the Music Department of the Foundation “Light of the world”, as violin player, conductor and choir master of the mixed choir, chamber choir and children’s choir, as vocal and instrumental teacher and tutor at the music school of the Foundation and performer in the music groups (youth vocal and instrumental bands). She participated in the big annual program every year at the Town Hall, Plovdiv and in the recording of the two CD’s of her husband – “Light of the world” and “The Land” – as well as playing concerts of many different styles and combinations in all the Plovdiv area and across Bulgaria. From 2003 to 2010 she was a member of the Balkan International Orchestra in Bacau, Romania and the Vidin State Philharmonic Orchestra (the Symphony Orchestra, Chamber Orchestra and the String Quartet “Vidin”) playing in concerts and tours all over the Europe. In 2010 she moved to Newry, Co. Down, Northern Ireland, where she established the musical duo ‘Virtuoso Ivanov’ together with her husband. 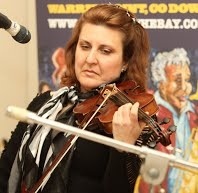 Since then she has played at many festivals and functions around Northern Ireland, including Blues on the Bay, Warrenpoint; Fladagh in Down, Warrenpoint; One World Festival, Derry; Multicultural Festival, Belfast; Mela Arts Ekta, Belfast; MAC, Belfast. At Newry Arts Centre she took part in the professional concert “Bulgaria and friends” with musicians from different backgrounds – Lithuanian, Polish, Irish, Russian; the concert “Agnieszka Osiecka” (for the celebration of the Polish writer in Newry); a lunchtime classical recital (to mark the International Holocaust Memorial Day) and the Anne Franck exhibition opening, performing a program of classical and Jewish instrumental melodies. She has worked as music teacher, teaching for SELB, GTCNI and NISTR, as lecturer in Music Performance at Sothern Regional College and as music director, performing musician (violin and vocal) and choir master with the Banbridge Community Chamber Orchestra and“Accolade” amongst others. She has also worked on many projects for youth clubs, community centres, Care homes etc. promoting cultural diversity. Recently she has studied the Suzuki method and she enjoys teaching the youngest violinists at the Ulster College of Music.